I'm not sure that this qualifies for our Vintage Sign Tour. 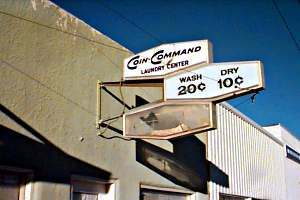 Although it's not called a "Laundromat", that term was first used in commerce on October 26, 1940, according to Westinghouse's trademark application. Just thought you might want to know that.